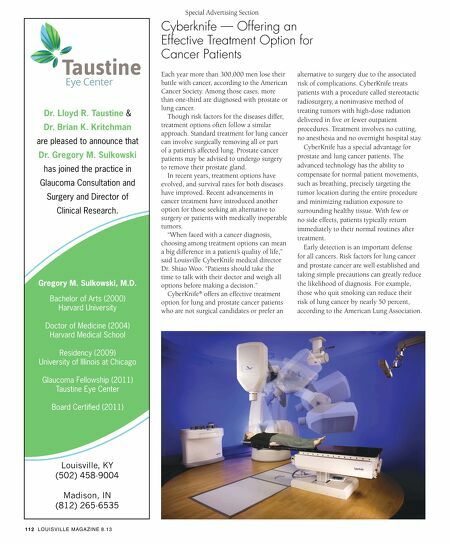 Special Advertising Section Cyberknife — Offering an Effective Treatment Option for Cancer Patients Dr. Lloyd R. Taustine & Dr. Brian K. Kritchman are pleased to announce that Dr. Gregory M. Sulkowski has joined the practice in Glaucoma Consultation and Surgery and Director of Clinical Research. Gregory M. Sulkowski, M.D. 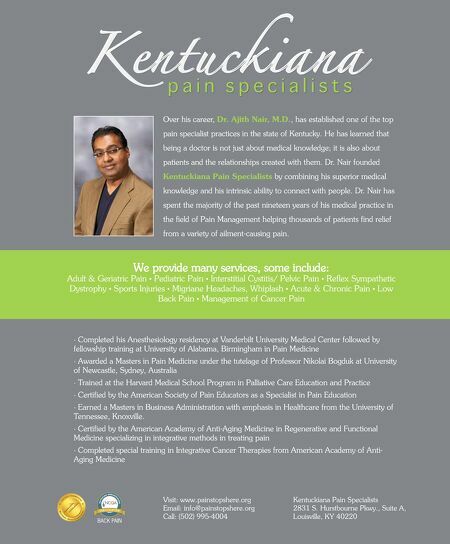 Bachelor of Arts (2000) Harvard University Doctor of Medicine (2004) Harvard Medical School Residency (2009) University of Illinois at Chicago Glaucoma Fellowship (2011) Taustine Eye Center Board Certifed (2011) Louisville, KY (502) 458-9004 Madison, IN (812) 265-6535 11 2 LOUISVILLE MAGAZINE 8.13 Each year more than 300,000 men lose their battle with cancer, according to the American Cancer Society. Among those cases, more than one-third are diagnosed with prostate or lung cancer. Though risk factors for the diseases differ, treatment options often follow a similar approach. Standard treatment for lung cancer can involve surgically removing all or part of a patient's affected lung. Prostate cancer patients may be advised to undergo surgery to remove their prostate gland. In recent years, treatment options have evolved, and survival rates for both diseases have improved. Recent advancements in cancer treatment have introduced another option for those seeking an alternative to surgery or patients with medically inoperable tumors. "When faced with a cancer diagnosis, choosing among treatment options can mean a big difference in a patient's quality of life," said Louisville CyberKnife medical director Dr. Shiao Woo. "Patients should take the time to talk with their doctor and weigh all options before making a decision." CyberKnife® offers an effective treatment option for lung and prostate cancer patients who are not surgical candidates or prefer an alternative to surgery due to the associated risk of complications. CyberKnife treats patients with a procedure called stereotactic radiosurgery, a noninvasive method of treating tumors with high-dose radiation delivered in fve or fewer outpatient procedures. Treatment involves no cutting, no anesthesia and no overnight hospital stay. CyberKnife has a special advantage for prostate and lung cancer patients. The advanced technology has the ability to compensate for normal patient movements, such as breathing, precisely targeting the tumor location during the entire procedure and minimizing radiation exposure to surrounding healthy tissue. With few or no side effects, patients typically return immediately to their normal routines after treatment. Early detection is an important defense for all cancers. Risk factors for lung cancer and prostate cancer are well established and taking simple precautions can greatly reduce the likelihood of diagnosis. For example, those who quit smoking can reduce their risk of lung cancer by nearly 50 percent, according to the American Lung Association.